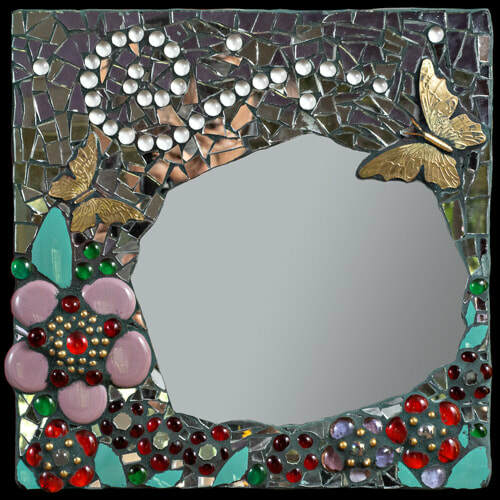 Join artist Mary Dignan in creating personalized mosaic mirrors! 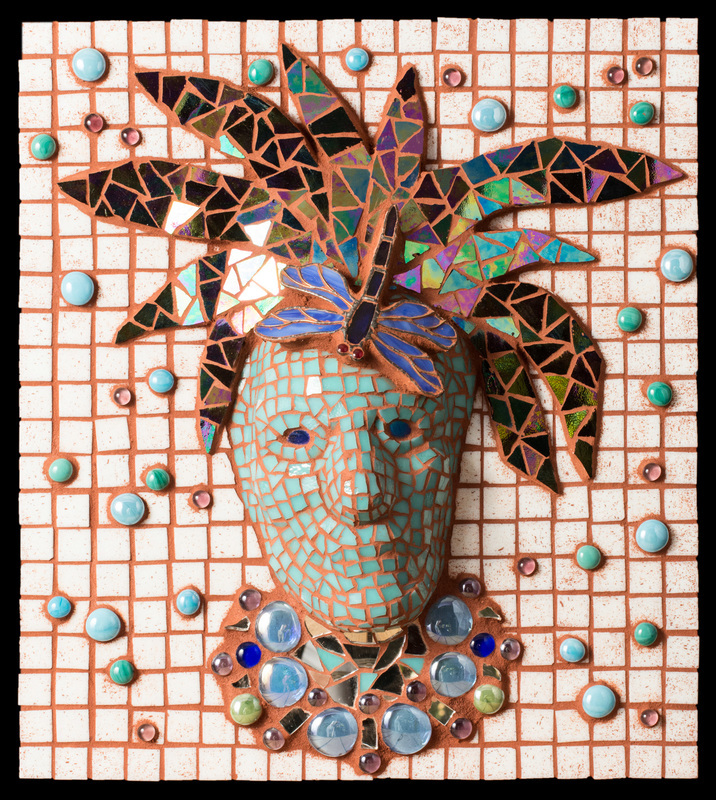 In this three day limited enrollment program she will be sharing advanced techniques for three dimensional mosaic art, as well as giving tips specifically designed for working with mirrors. Prerequisite: Beginning mosaics or previous experience with mosaics or ceramic tile. Class participants are encouraged to bring materials significant to them: perhaps tiles or stained glass in a favorite color they want to work with, a special shell or pebble collection, a broken heirloom china piece or ceramic figurine, or costume jewelry. Additional materials will be provided. Click here to visit the Creative Edge website and for more information. Click here to download the PDF file 1 and PDF file 2. 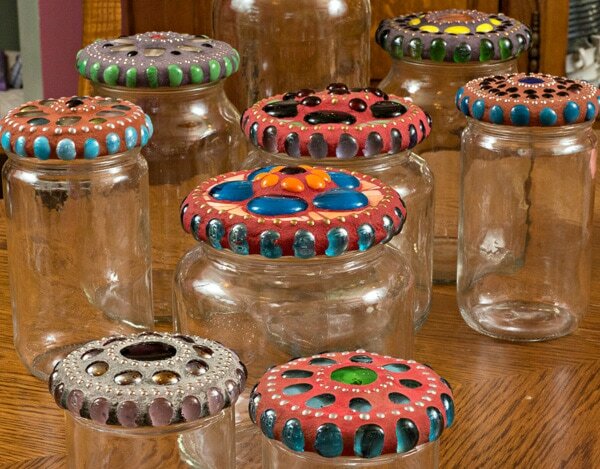 *Learn how to make one-of-a-kind treasure jars! *Give as gifts or fill with your favorite treasure or treat! Treasure Jars are beautiful and unique containers that are perfect for gift giving and upscale storage. In this class you will learn from master mosaic artist Mary Dignan the techniques to design and make your own exceptional lids for small glass jars. 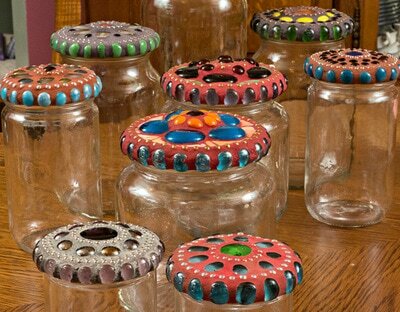 These distinctive jars are made to be filled with treasures and trinkets, and look amazing lined up together on a shelf. If you often give gifts of homemade treats, these jars are ideal containers to make your gifts even more impressive. The first day you will design and glue your pattern, and on the second day you will grout and polish for a stunning, one-of-a-kind project. Download PDF file, click here. The "About Face: Mosaic Masks" class turned out to require a lot more work and time than any of us expected. Indeed, it was not until teaching this class that I truly comprehended how complex and challenging my mask mosaics really are. But the results are well worth the extra time and effort, and the mask mosaics my students created are stunning. (I think mine turned out well, too, even if I do say so myself). 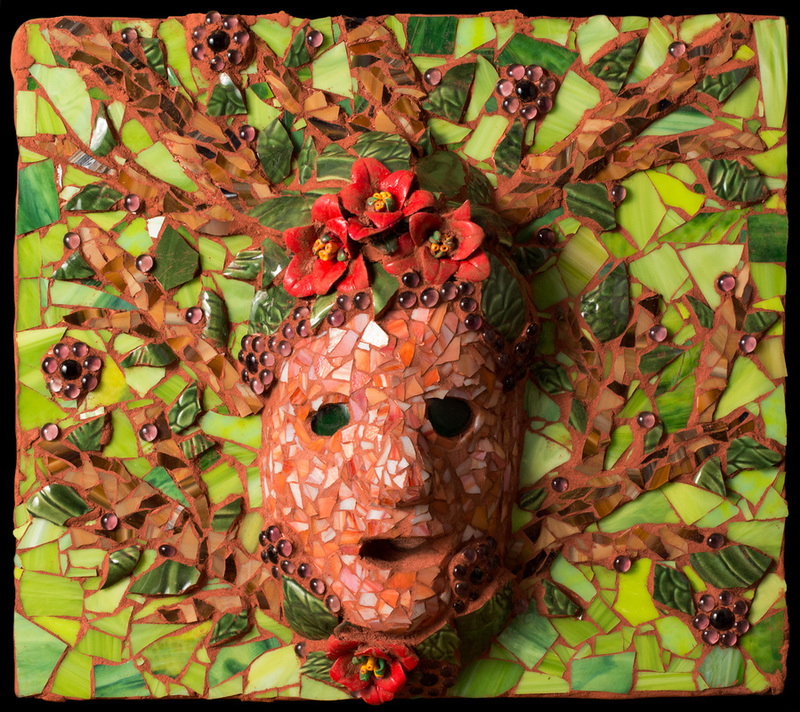 ​Making your own personal mask can be a uniquely insightful exploration of the faces you show (and don't show) the rest of the world, and an empowering experience as well—all the more so in a mosaic process. 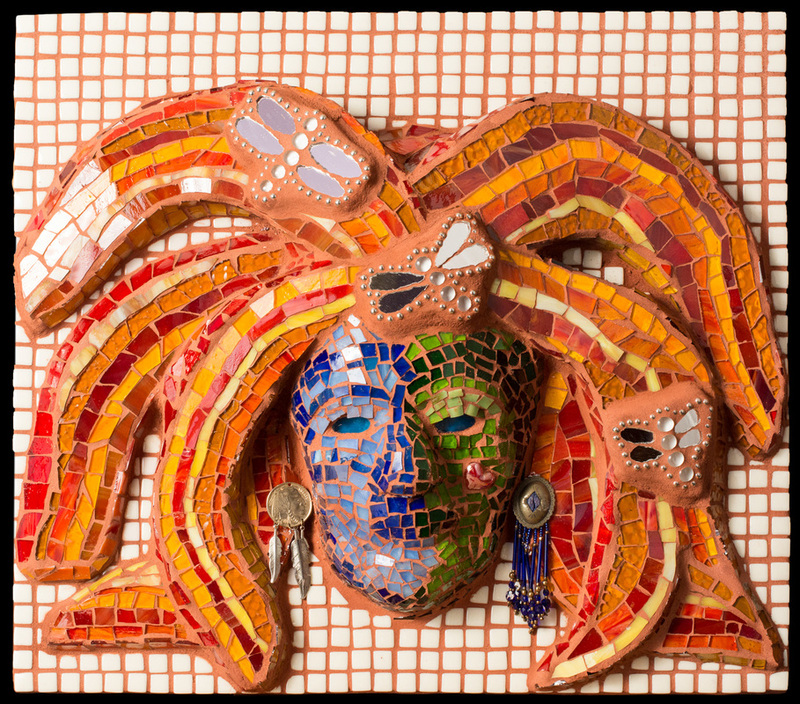 In this class, students will make plaster masks of their own faces, and then use those masks as a base for a personal mosaic. 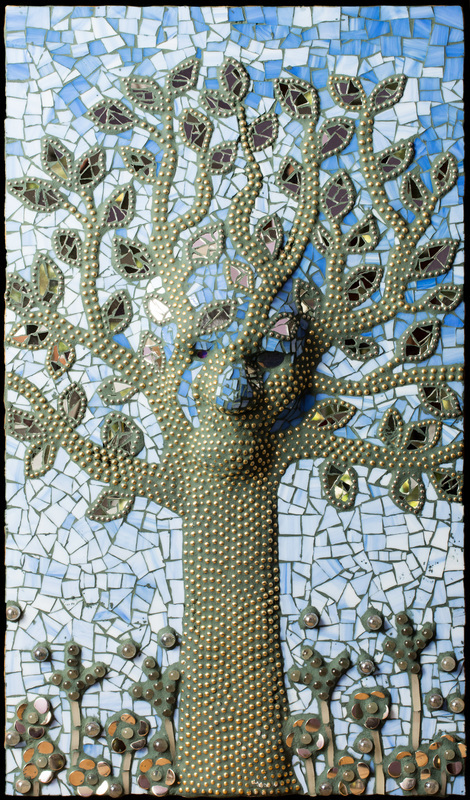 This class will require a significant amount of work at home outside of class hours, and is for experienced mosaic artists only (students should have taken at least two previous mosaic classes.) Bring your own bag lunch. Healthy snacks provided. ​To assure your space, you must register in advance. Class size is limited so register early. Or send your check made out to "The Creative Edge," to 8822 Swallow Way, Fair Oaks CA, 95628. 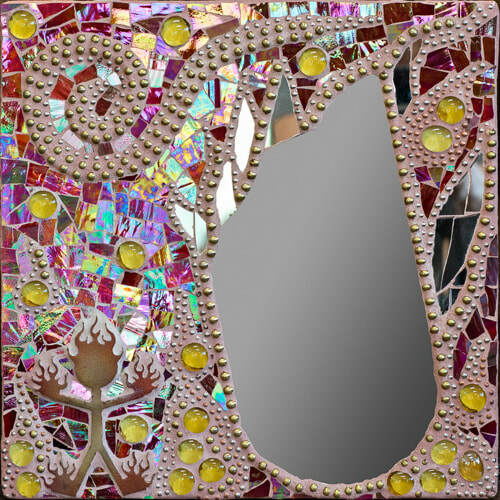 Join artist Mary Dignan in creating personalized mosaic mirrors! In this class she will be sharing advanced techniques for three dimensional mosaic art, as well as giving tips specifically for working with mirrors. Fee covers class materials and use of tools. 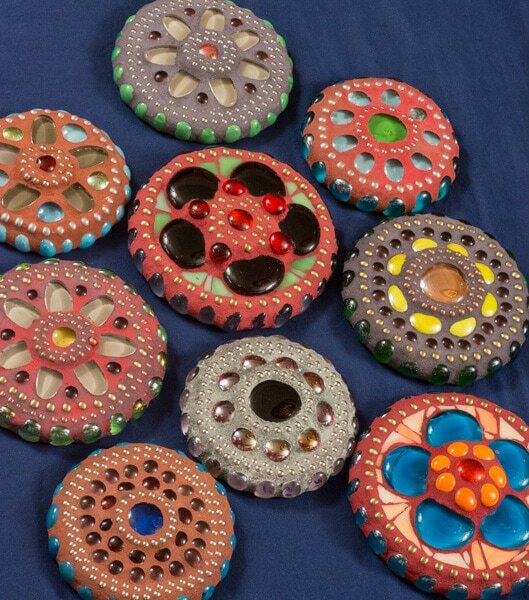 A personal set of new tools may be purchased from the facilitator at class for $50. Class limited so register early. or by calling Andy, 916-648-1803. Spirit in the Arts is a program of Bread of Life, located at 650 El Camino Avenue (in the North Sacramento United Methodist Church building, close to Del Paso Boulevard).